This is one of my side-projects that really helped me sorting my emails with Outlook when I was managing projects and had many emails coming on various topic. I had many project folders with issues to follow and emails rules didn't make it. I found drag & drop system to be very poor for sorting emails quickly among various folders. ...to my surprise I did not find any existing tool easing this process, so I've built one. I've decided to share it freely along with documentation, but if you like it please do consider a small donation . Last edited by DigiDon on 30 Jul 2018, 15:03, edited 9 times in total. With my 200-300 folders, this will be very handy. Last edited by DigiDon on 18 Jun 2018, 03:43, edited 1 time in total. What's the difference between the two download? No, the Add-In is a total rewrite of the vba module. They are separate technologies. The VBA needs a quite complicated install but then source code can be easily modified. The Add-In has a simple installer and directly integrates with Outlook and cannot be modified easily. One disadvantages however is that it seems it is not possible to have a keyboard shortcut to it. I would recommend using the Add-In if it works well for you, mainly because I rewrote it and it indexes the list of folder for faster display. The VBA lods the folder list everytime it is started. In your case (200 folders) I guess the VBA might therefore be slower. I have a little problem with the Add-in. After having closed my outlook session ( Outlook 2013 ), it seems that the add-in will not restart automatically after .. and I cannot restart manually ..
and Congrats for your job ! Thanks for your positive feedback. I also found it unbelievable that this functionality was neither offered nor found anywhere! It should have been there many years ago but I'm glad I've made it available at last. Regarding your issue, I have not experienced it with Outlook 2016 nor had feedback on this issue yet. -Are the addin buttons still visible ? 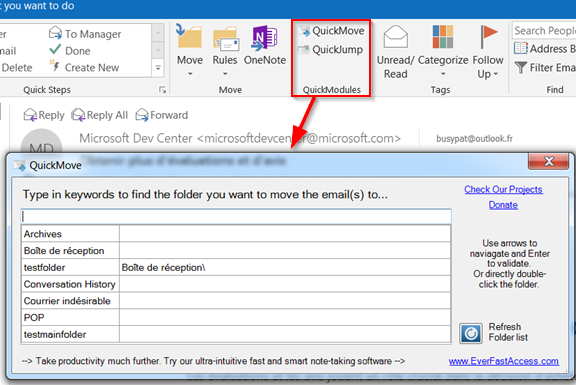 -Was the addin automatically disabled by Outlook? -Have you tried to kill/restart outlook process completely? / Reboot computer? Still happening on first close? Worst case you could switch to vba project in the meantime you/I/someone find the cause and solution.